I'm so excited to write this post because this is one beauty product that I've been wanting to get my hands on for ages now and it's EVERYTHING. Maybe its the autumn feels, maybe its the change of taste or whatever but I'm so drawn to red/orange tones. They are suddenly just SO appealing and Kylie seriously launched this when my heart was seeking for a palette with those tones and I HAD to get it! The palette was very well protected, it came in a protected sleeve, in between sponges - yes very well protected and it was in top condition despite the journey from US to UK. And the moment of truth! I was seriously gasping at this point of time. I mean, just look at the shades? There's a good mixture of mattes and shimmers which is great. 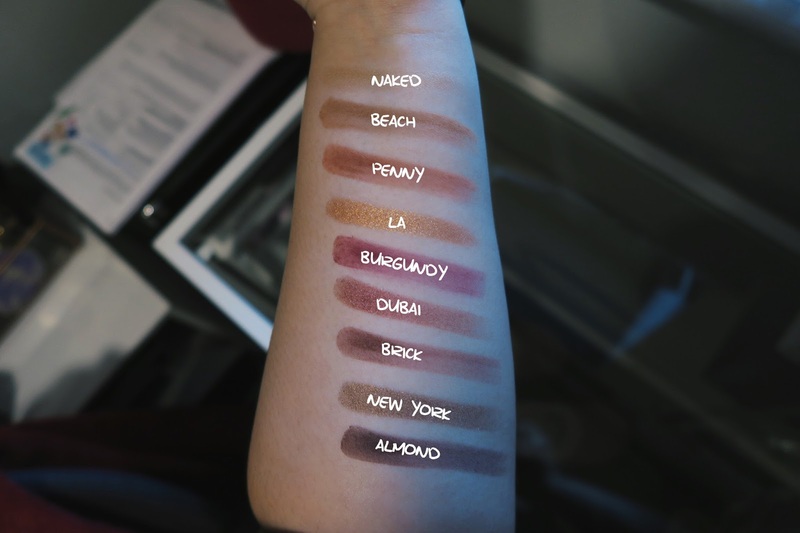 Swatches! Yes a for effort for me but they are so pretty! Initially my favourites were the shimmer but I've grown to use and love mattes more after a couple more uses. Okay so my verdict after using it multiple times - they are very pigmented and creamy. Really good quality! BUT one thing though, the shimmers are not as creamy/pigmented when compared to the mattes. They pick up really well on the fingers but when you use brushes to pick up the colour to your lids, it's not showing as much and you'll have to pack more to get that impact. But if you're going for like a subtle shine, little shimmer here and there it's perfect. All in all though, the colours are great, I don't know how kylie is going to top this palette and I'm so glad I got my hands on these for the first batch of release! Shout out to my bf though, he was the one that secured the order on the release day and time while we were at Justin Bieber's concert! Hope you enjoyed this and the palettes are all in stock now should you want to get your hands on this beauty.